When Madeline Hatter™, Cedar Wood™ and Holly O'Hair™ decide to team up with gourmet chef Ginger Breadhouse™ on a bake sale, the girls really cook up a storm! Ginger Breadhouse™, the daughter of the Candy Witch in Hansel and Gretel, would rather bake desserts for people than have people for dessert. She practices her baking skills in an enchanting cooking classroom designed with lots of sweet style and full of fun! The two-story gilded oven gets things "cooking" with removable "flames" on the inside, a cauldron hanging on the outside and two working doors -- one of which is a secret back door inspired from Ginger's fairytale story. A highly detailed cooking table adorned with gingerbread men and covered in frosting offers workspace with style. A candy-decorated easel holds the house's blueprints but also doubles as a photo frame for girls' own pics! Simply remove the gingerbread house poster and replace with another photo. A wooden detailed ginger seat and a wafer-textured bench provide spots for play and display with Ginger Breadhouse™ doll and friends (other dolls sold separately). Plus, the bench opens for secret storage. Ginger doll looks spelltacular in an iconic dress with bright colors, dripping frosting and a gingerbread man print. Cutout boots with chocolate frosting and gumball heels, gingerbread man earrings, a pink frosted belt, chef's hat headband and golden glasses are the icing on the cake! 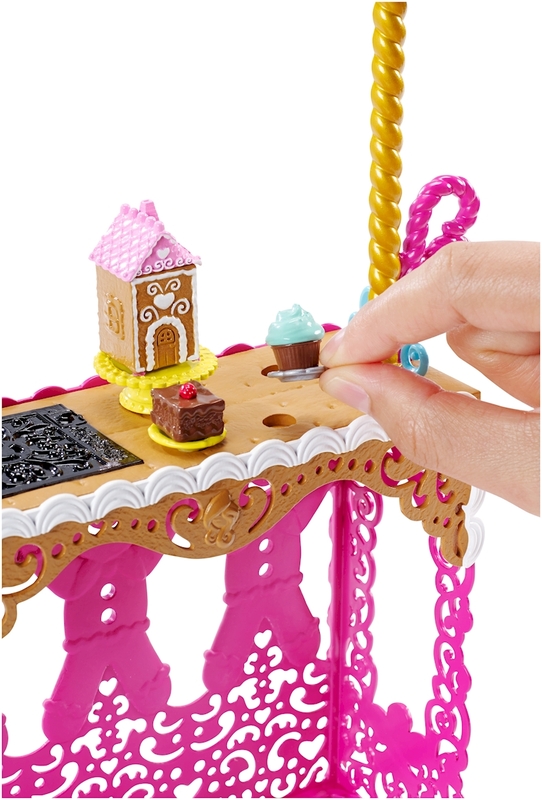 A doll hairbrush and doll stand are included to capture sweet moments in the kitchen. Collect all of the Ever After High™ baking dolls to create a full menu (each sold separately).